The HPV genome is an 8 kbp circle of double-stranded, covalently closed, and his-tone bound DNA, which is maintained as an episome in infected cells during the productive virus life cycle. It encodes eight viral proteins across three frames (Fig. 1; see Color Plate 2, following p. 50) (18). The HPV genome is histone bound and surrounded by a 55-60 nm, nonenveloped icosahedral capsid (19) of T = 7 symmetry, which contains the genetically unrelated major capsid protein L1 and the minor capsid protein L2 (Fig. 2; see Color Plate 3, following p. 50) (20). Each capsid contains 360 L1 monomers assembled into 72 pentameric structures termed capsomeres (20). 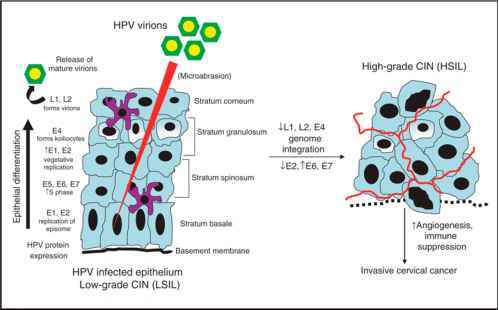 It is likely that within the HPV virion, a single copy of L2 is positioned in the center of each capsomere (unpublished data) bound to LI through two domains in L2 (21). Fig. 1 (Color Plate 2, following p. 50). 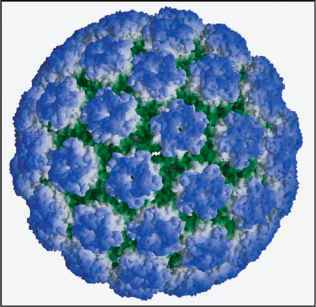 HPV genome organization. Schematic of the human papillomavirus 31 (HPV31) genome showing the arrangement of the major nonstructural and capsid genes along three frames. HPV31 mRNAs were investigated in CIN612 cells containing extrachromosomal HPV31. Four promoters were identified by primer extension, RNase protection, and nuclease 51 and ExoVII analyses (designated P77, P99, P742, and P3320 based on their respective nucleotide start sites). Adapted from reference 18. Fig. 2 (Color Plate 3, following p. 50). HPV structure. Model of the T = 7 icosahedral capsid (~60 nm in diameter) of the HPV16 virion exhibiting distinct fivefold axial symmetry surrounding a nucle-ohistone core. Adapted from reference 20.